My previous post was about Italo Calvino, and in particular his essay on the ‘literature machine’. If all writing is ‘simply a process of combination among given elements…merely the permutation of a restricted number of elements and functions’, then it should be possible for a program or machine to play with the permutations and transformations in language in a kind of ‘combinatorial play’, and thus generate new texts. Since writing that piece I’ve come across the concept of VOLVELLES. A volvelle or wheel chart is a type of slide chart, a paper construction with rotating parts. It is considered an early example of a paper analog computer. Volvelles have been produced to accommodate organization and calculation in many diverse subjects. 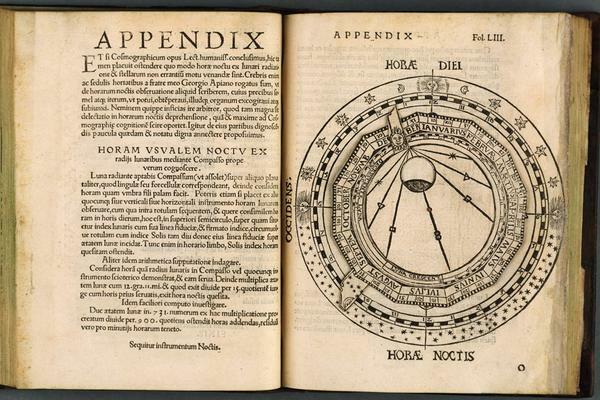 Early examples of volvelles are found in the pages of [books on astronomy and astrology]. They can be traced back to ‘certain Arabic treatises on humoral medicine’ and to the Persian astronomer, Abu Rayhan Biruni (c. 1000)… The most ancient example of a simple volvelle was the pentagram from Hammurabi’s day that has become the symbol of witchcraft [the Venus volvelle]. 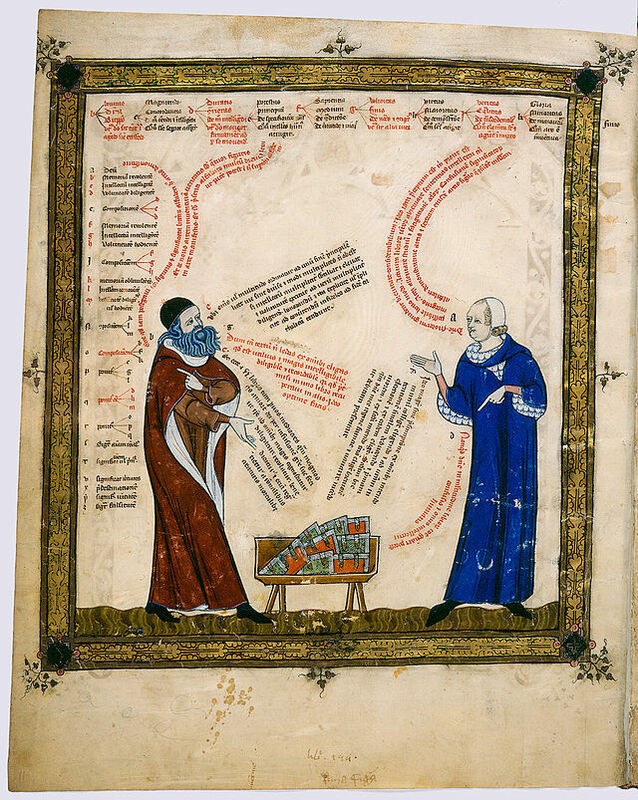 The father of Western ‘combinatory text generation’ is often said to be the Majorcan writer-philosopher and Franciscan, Ramon Llull (c. 1232-c. 1315; his name is usually anglicised to Lull), who is said to have used Arabic astrological lore – and the related device called a zairja – in forming his Ars combinatoria. An academic account of Lull’s Art and related arcane systems is given by Janet Zweig in her paper: ‘Ars combinatoria: Mystical Systems, Procedural Art and the Computer’. She explains that Lull used letters of the alphabet as ‘symbolic notation for the Divine attributes; the letters are placed on revolving wheels and can then be mechanically combined with other data’ in order to ‘prove systematically the reality of universal Christian truths’. It is thus a ‘prototype of an expert system’ that requires ‘a user or “artista”, who can mobilize the structure to apply it to scientific questions’. 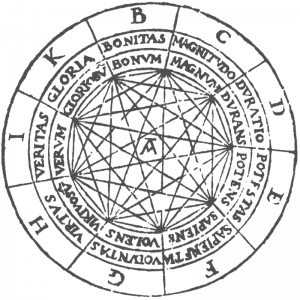 In a sense that had already happened by the end of the 16th century: by Agrippa’s time, Lull’s combinatory art had already blended with poetic practices dating back the 4th century – centos comprised of cut and pasted fragments from poems and chance operations as with bibliomancy – and updating it to suit the latest tastes. Poetic ‘machines’ were used to piece together syllables into words, words into verse, proving that computer-generated poetry isn’t just a child of the 20th century. Stéphane Mallarmé’s poem Un coup de dés Jamais N’Abolira le Hasard (1897), [can be] imagined as a metonym for his multivolume, combinatorial Book, Le Livre. A radical experiment in design and typography, Un coup de dés privileges form over content — or rather, form as content, such that blank spaces, typography and the material folds of the book, rather than semantics, generate what Mallarmé calls “prismatic subdivisions” of meaning on the page. This unusual use of the book’s architecture leaves the reader, rather than the writer, to cull and combine these scattered fragments of text through multimodal acts of association; thus the reader — Mallarmé prefers the word “operator,” etymologically linked to “work,” oeuvre, from the Latin opus — becomes an (inter)active participant in the poem’s construction. (Footnote omitted.) …Like the four hands floating around Harsdörffer’s Denckring — like manicules — like the reader’s hand spinning the discs — like the finger that points and clicks — the hand will cut up the hand that recombines. The coherent abstraction of a textual icon, dismembered from its body, reconnects through the process of an embodied hand that moves, spinning a web of combinations. This site has extensive and erudite sections on Permutational Poetry, like Mallarmé’s (or one could add the Fluxus artist Emmet Williams, cited by Zweig). Raymond Queneau, founder of Oulipo, as noted in my previous post, in 1961 published Cent mille milliards de poèmes; each page contained a rhymed sonnet. The separate lines of the pages could be peeled back and recombined into an almost infinite number of new poems, as the title indicates (online versions can easily be found). Members of Oulipo (and Alamo, which arose from it) used artificial constraints and generating systems to produce literary works – Zweig gives other more recent examples, such as Charles O. Hartman, who distinguishes between text generators which start with a corpus of vocabulary with no source text, and those which rearrange vocabulary from an existing text; she also cites manipulators of hypertext and the French group LAIRE and other ‘new media poets’. Leibniz’s Alphabet of Human Thoughts incorporates ‘his notion of a mathesis universalis — a method of generating, with mathematical certainty, the answer to any philosophical question’ (Trettien). 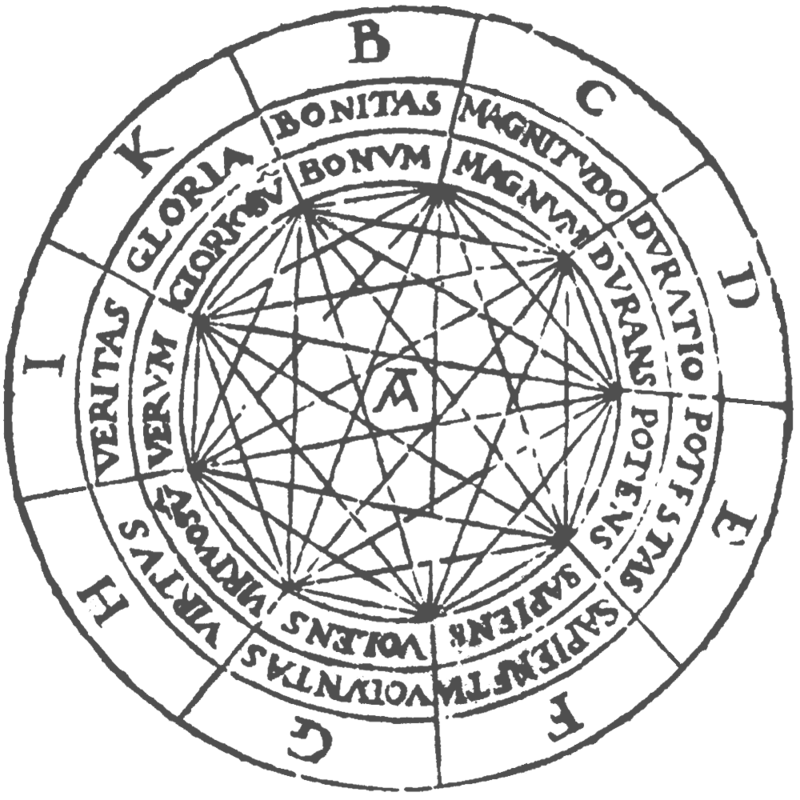 In 1666, at the age of twenty, Leibniz defended his Dissertatio de Arte Combinatoria, in which he explores Ramon Llull’s ars magna, or his combinatorial art — a subject tackled by many thinkers of the period, including Johann Heinrich Alsted and Athanasius Kircher. 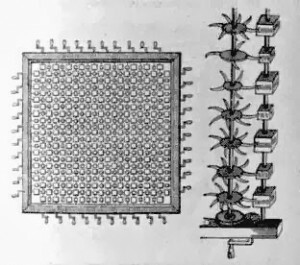 Like Lull himself, Leibniz ‘explores the art of combination not simply as mechanical means for permuting discrete elements, but as system for logical discovery…Both poetry and philosophy become not product but process — a system, mechanized in a set of nesting paper wheels, whose very existence instantiates its combinatory possibilities (Trettien)’. In 1694 he produced the Stepped Reckoner: an early paper form of calculator. From here it’s a short step to the Kabbalah, the symmetrical strings of DNA, carbon atoms, Big Bang cosmology and mathematical Set Theory. From the 18C on volvelles tended to be used less for mystical or universalist purposes, and more as systems for ‘symbolic logic, semantic invention or pure process and play’ (Zweig), as in musical dice games, or the ballet dancers with cards referred to by Trettien. ‘Music, with its abstract notation, lends itself directly to recombinancy’ ; John Cage in recent years produced recombined musical elements and computer-generated recombined written texts (Zweig again). It was twenty feet square, placed in the middle of the room. The superfices was composed of several bits of wood, about the bigness of a die, but some larger than others. They were all linked together by slender wires. These bits of wood were covered, on every square, with paper pasted on them; and on these papers were written all the words of their language, in their several moods, tenses, and declensions; but without any order. The professor then desired me “to observe; for he was going to set his engine at work.” The pupils, at his command, took each of them hold of an iron handle, whereof there were forty fixed round the edges of the frame; and giving them a sudden turn, the whole disposition of the words was entirely changed. He then commanded six-and-thirty of the lads, to read the several lines softly, as they appeared upon the frame; and where they found three or four words together that might make part of a sentence, they dictated to the four remaining boys, who were scribes. This work was repeated three or four times, and at every turn, the engine was so contrived, that the words shifted into new places, as the square bits of wood moved upside down. An online Lagado Engine based on Markov models (whatever they are) can be found here; it can be used to generate new text from old, just like the one Gulliver witnessed in 1726. The 8vo website points out that the ‘random babbling’ generated by such an engine is an early example of what came to be known as the Infinite Monkey theorem: “that a half-dozen monkeys provided with typewriters would, in a few eternities, produce the works of Shakespeare” – traced by Borges in his essay “The Total Library”. This website gives a clear and informative account of volvelles and the development of ‘paper computing’, with some excellent illustrations. Cosmographicus Liber (Cosmographia) by Petrus Apianus was first published in 1524. Apianus (1495-1552), a mathematician, printer and instrument maker, studied cosmography and mathematics in Leipzig and Vienna. This book, a layman’s introduction to the science of the time, had little original content and was based largely on Ptolemy. Among other subjects, it describes planetary motion and terrestrial geography, techniques for celestial navigation with mathematical instruments, telling time, and measuring distances. 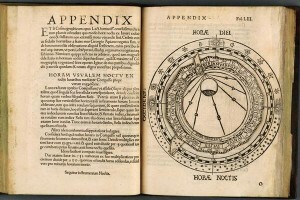 It contains many woodcut illustrations, including moveable stacked illustration plates called volvelles, which could be manipulated to make calculations. (The History and Future of the Book website has several more splendid colour illustrations from the book, including volvelles.) A first edition at the Smithsonian Institution Library can be consulted online at Archive.org here; it too has (monochrome) illustrations, eg at col. 63. Humans have always yearned to create a systematic engine to facilitate our access to all knowledge; George Eliot’s desiccated scholar, Casaubon, is a salutary reminder that a Key to all Mythologies is a delusion; but that doesn’t stop us striving to produce a Literature Machine. As Arthur C. Clarke’s sci-fi story has it, when Tibetan monks compute the last of the 9 billion permutations of the names of God, the universe ends. And there I’d better stop, for the permutational possibilities of this topic are surely infinite: we’ve gone from witchcraft, mystical-arcane computing and astrology to Led Zeppelin. Sometime soon I’d like to turn to another Calvino-related topic: the French group of avant-garde writers called Oulipo.